Fly fishing Patagonia Argentina for wild Brown, Rainbow and Brook trout. Estancia Tecka is a 400,000-acre ranch in the Eastern shadow of the Andes. Fly fishing the Corcovado and Tecka rivers in Argentina gives you an amazing water variety. 45 miles of the Corcovado river and Tecka spring creek flowing through the ranchThe largest fly fishing property in Argentina gives you incomparable seclusion and privacy. Fly fishing Estancia Tecka is a unique Experience. Fishing: With over 400,000 acres, 45 miles of the Corcovado river plus 20 miles of the Tecka flowing through the ranch, here you can experience fantastic fly fishing for wild Brown, Rainbow and Brook trout. Fishing is done both by wading or floating the Corcovado river or by wading the Tecka. The smaller Tecka is really a spring creek with slow clear water. The immense variety and quantity of waters and allows you to enjoy both dry fly and streamer fishing. Fly fishing Estancia Tecka in a place of spectacular beauty located in the Eastern shadow of the Andes in Argentina. Here you can enjoy fly fishing in practically virgin water while in complete solitude. Professional bilingual guides and fly fishing instructors, attentive staff, exquisite cuisine and selected wines make this trip a must if you are considering a fly fishing trip to Argentina. 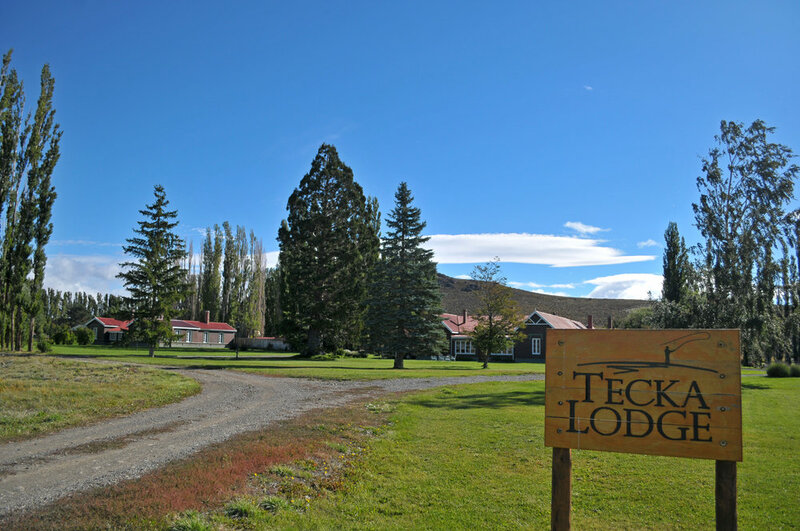 Location: The Tecka fly fishing lodge is located in the heart of Patagonia in Argentina, only two hours from the city of Esquel and just a few miles from the border with Chile which allows combination with Estancia de los Rios in Chile. Lodging: Hosting 18 guests per week, guests enjoy extraordinary style and comfort on two well appointed sister lodges located inside the ranch. Both lodges are strategically located to access the best fishing. Caridad lodge has 5 double rooms and the Headquarters lodge 4 double rooms. All rooms have private bathrooms and gorgeous vistas. Both offer equally comfortable accommodations with ample interior spaces ensuring your comfort and privacy. Getting there: Fly to Buenos Aires (B.A.) Argentina's capital, then fly to Esquel in the heart of Patagonia. An overnight in Buenos Aires on arrival is recommended. If you want to fly directly to Esquel on the same day, consider at least three hours between your arrival time in B.A. and the Esquel flight departure time. Once you arrive at the Esquel airport, a representative from Tecka fly fishing lodge will pick you up for the 2-hour drive to the Lodge. Land transfers or air charters from Bariloche, Argentina can also be arranged. You can also reach Tecka fly fishing lodge traveling overland from Chile, we can arrange transfers from several of our other fly fishing lodges both in Chile and Argentina. Included: All meals and accommodations, 6-days of guided fishing on the Rio Corcovado and the Rio Tecka , one guide per two guests, fishing licenses, transportation to and from fishing, transfer to/from Esquel, all alcoholic beverages, laundry service. Not Included: Air fare and special transfers, fishing gear, guide & staff gratuities. Single guests: If you are coming alone, you will need to pay the single room supplement and you may share a guide with another angler. If you prefer both single room and guide, you have to purchase two fishing packages. Saturday to Saturday is the standard program. Stays other than Saturday to Saturday can be arranged, but only for bookings after November 1, 2011 and are charged at the “other” rate, see chart above. Flights: Flights From Buenos Aires to (from) Esquel are scheduled on Saturday, Tuesday and Thursday. Arriving from Bariloche: Guests can also reach the lodge from Bariloche. Land transfers from Bariloche are approx. $450 one way. Charter flights from Bariloche to the lodge are approx. $2,000 one way. Arriving from Chile: Guests can also reach Tecka traveling overland from Chile, we can arrange transfers from several of our other lodges in Chile. Prices upon request. Depart the USA on an evening flight arriving in Buenos Aires the next morning. Although sometimes is possible to connect a flight to Esquel the same day, an overnight in Buenos Aires is recommended. Please note that in Buenos Aires the international and domestic airports are in different locations. A normal transfer between airports can take an hour or more depending on traffic. If you want to fly to Esquel on the same day, consider three hours between flights. Arrive from Buenos Aires to the Esquel airport in the late afternoon, meet a representative from Estancia Tecka for the 2-hour drive to the Lodge. After settling in your guide will assist you getting your tackle ready for an evening's fishing session. Returning to the lodge on time for cocktails and Dinner. The typical day at Tecka is as follows: After an early breakfast you will meet your fishing partner and guide and depart for the day. The variety and amount of water available allows the guide to choose from several beats of either the Corcovado river or the Tecka spring creek depending on local conditions and guest preferences. Guides will let you know the fishing plan the day before. After a morning fishing, guests typically stop for a streamside lunch. After lunch you can either relax or try a short siesta before you continue fishing, returning to the lodge for Cocktails and Dinner around 8 or 9 PM. The last day you can enjoy your favorite water during the morning returning to the lodge for lunch. After getting organized a lodge vehicle will drive you back to Esquel on time for your flight to Buenos Aires and beyond.